Home > Guitar tuition > Is Jam Play any Good? Is Jam Play any Good? Is Jam Play any good? That is the question I was keen to answer when I took out a 1 month subscription recently. What I wanted to know was what does it offer me as a guitarist with a lot of years behind me who perhaps hasn’t progressed as far as I would have liked. 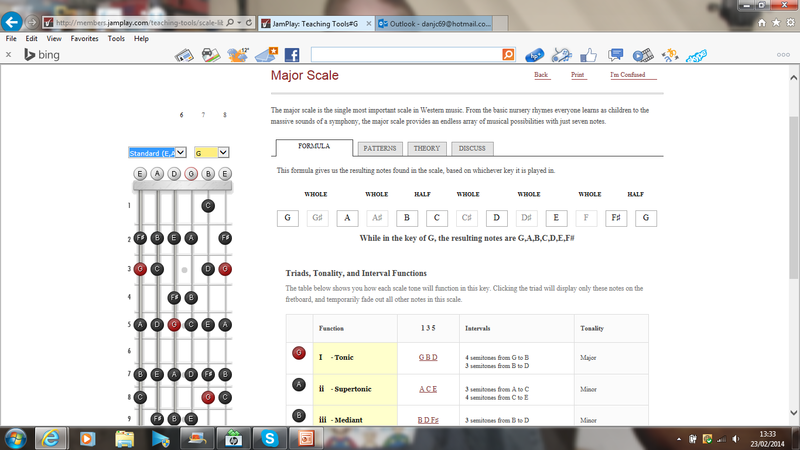 In essence will it help me to become a better guitarist? Before answering the question is Jam Play any good it is perhaps worth describing what Jam Play is. There are a number of ways that you can learn to play the guitar. Back in the late 1980s when I started to learn the guitar it was fairly straight forward. Guitar teacher or teach yourself books and correspondence courses. However, with the arrival of the internet the number of online guitar tutorial sites all looking to help us become better guitarists exploded. Many of the more entrepreneurial guitar tutors saw the opportunity that the internet provided. From delivering face to face lessons to a limited number of students per week to providing guitar lessons 24 hours a day to a truly global audience the internet has truly changed the face of guitar tuition. But, as with anything associated with the internet some of these online providers are good and some are not so good. If you do a quick google search for online guitar lessons you will find that the two most common names that appear in the search are Guitar Tricks and Jam Play. These are perhaps the two most well known providers of online guitar lessons with Guitar Tricks being the number 1 in terms of members. I will be reviewing and comparing Guitar Tricks and Jam Play in due course but for the time being I want to just focus on Jam Play. So what is Jam Play? Jam Play has taught over 310,000 guitarists since it went live in 2006. 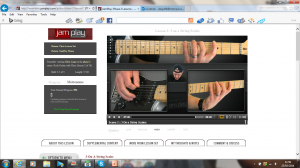 There are currently 4186 guitar lessons all shot in HD. On average Jam Play add 11 hours of new learning material every 30 days. Jam Play currently has lessons taught by 72 professional musicians with a combined 2504 years of guitar playing experience. Jam Play tutors include Ron “Bumblefoot” Thal of Guns & Roses, Steve Stevens guitarist for Billy Idol and Mike Mushok from Staind. The list of top guitar players who teach for Jam Play is truly impressive. So with all these facts and figures I wanted to find out for myself is Jam Play any good? As I have mentioned I first picked up the guitar in the late 1980s so I am not a complete novice on the guitar. So what am I looking for from Jam Play? Well first I want to improve my guitar playing so that I have a better understanding of how to construct a tune, play a solo and to be able to do this in different musical styles. The main driver for this is that, I don’t know about you but, I find myself playing the same things over and over so I could do with a little bit of help to freshen up and improve my technique. I am busy with other commitments and so fitting a lesson in can sometimes prove difficult. So I want lessons to be broken into manageable chunks that can fit in around what I am doing. I also want to feel motivated. There are times when I am just so bored of what I am playing on the guitar that it almost feels like a bit of a chore to pick it up. This of course is largely due to the fact that my repertoire has become a little stale but for me to break out of that the teachers have to keep me interested so that I want to learn more. Armed with this learning criteria I was ready for my Jam Play trial. Fortunately for me a family member knew that I was interested in Jam Play so purchased a gift card for 1 months membership to Jam Play for Christmas. So armed with my gift card I headed over the site to open my account. However, disaster struck as my gift card code was not accepted when I entered it into the site. Not such a good start. But they say that every failure is an opportunity to impress and this proved to be a great example. I contacted Jam Play and within the hour I had a response from Janessa at Jam Play who apologised and opened my account there and then. This was a Sunday afternoon by the way so I was pretty impressed by the speed of response. So with access to my new account I took the opportunity to look at my personal dashboard and find my way around the site. The good thing about Jam Play is that you can tailor everything to your own particular requirements. You can choose your level of skill on the guitar, the genre that you want to learn or pick from a huge number of songs which you can learn. The choice is yours. For example if you are a novice on the guitar you can learn basic techniques from tuning a guitar to basic chords and scales. If you are interested in learning a particular musical genre there are lessons grouped by genre to make this easier. So if you like funk, rock, blues, metal or jazz click on the relevant icon and you have all the lessons pertinent to that genre. 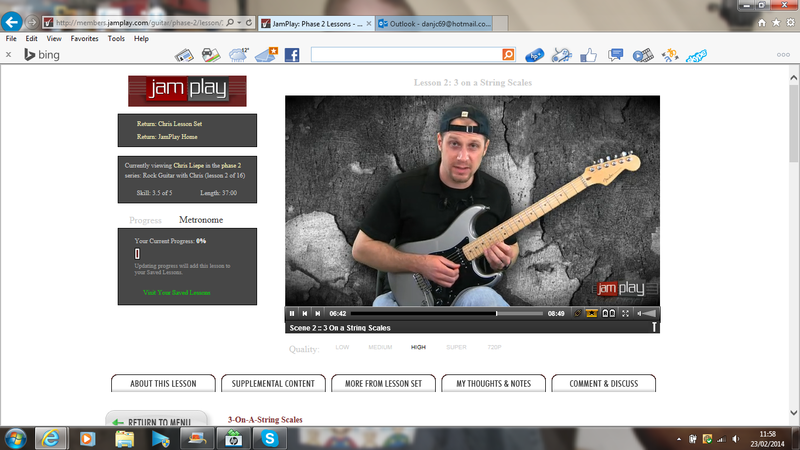 I chose to learn Rock Guitar with Chris Liepe, a series of 16 lessons. 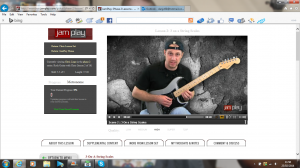 I decided to try out some rock guitar lessons and picked Chris Liepe’s Rock Guitar course. In this particular course there are 16 lessons starting with the basics of rock guitar and gradually progressing to harder techniques. On the way I was to learn how to construct rock chord progressions and how to build a solo that would work over those chord progression. There were numerous techniques and skills covered and I have to say that Chris put them across in a relaxed but encouraging manner which I found really excellent. The lesson is filmed in HD and the there are multiple camera angles which capture every position of the teachers hands on the guitar. I found this particularly useful as I was able to see how the teacher managed to pull off some of the harder guitar techniques. Multiple camera angles captures all the fretboard action. Of course as it is an online course you can pause, rewind or fast forward at anytime. So if there was something that you didn’t quite catch you could rewind and view it again and again and again without the teacher complaining about why you hadn’t managed to pick up the technique a bit quicker. There are other cool video features such as A to B looping which allows you to select any two points in a video and set a continuous loop between those two points. There is also a book-marking feature which allows you to book mark a piece of video which you can go back to at anytime. With Jam Play all the lessons are transcribed and can be printed for use off line. After rock guitar with Chris Liepe I went over to the song library. This is a truly comprehensive database of lessons designed to help you learn songs on the guitar. I didn’t count how many songs that Jam Play have covered but I think that I can safely say that there is something there for just about any musical taste. Being a Steve Stevens fan I decided to look at his lesson for the song Rebel Yell. Once again the lesson was videoed in HD and there were multiple camera angles to capture exactly what Steve Stevens was playing. The great thing about Steve Stevens taking you through the lesson is that, as he was the one who played the guitar on the original, he knows exactly why he decided to play a certain note or lick. This for me was a truly invaluable in-sight into how Steve went about constructing the guitar voicing for Rebel Yell and how the song should be played. Build your own personalised scale or chord library. Jam Play is a great site which has been put together so that us, the users, get the most out of the learning experience. The best thing about Jam Play is that you can truly personalise it so that you achieve your particular learning goals on the guitar. If you want to learn chord voicings you can build yourself a library that you can come back to at anytime. 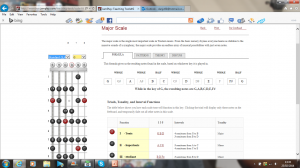 Want to build up your knowledge of scales then you can do the same and build a scale library. Everything is designed to be personalised and I think this is what makes Jam Play so good. As you can tell I really think Jam Play is a great investment if you want to get better on the guitar. If you are a complete novice then I am confident that Jam Play will teach you how to play very quickly. If like me you have a bit of experience on the guitar then I would like to think that, as it did for me, Jam Play will re-invigorate your playing and get you doing things you never thought you could achieve. So in answer to my question is Jam Play any good the answer is a resounding yes! 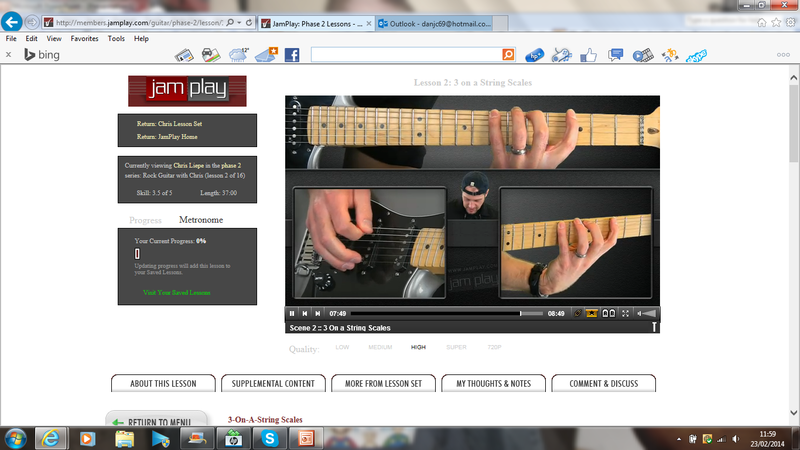 I would highly recommend Jam Play if you are looking for an online provider of guitar tuition. You can give Jam Play a seven day money back guarantee by clicking on the link below.